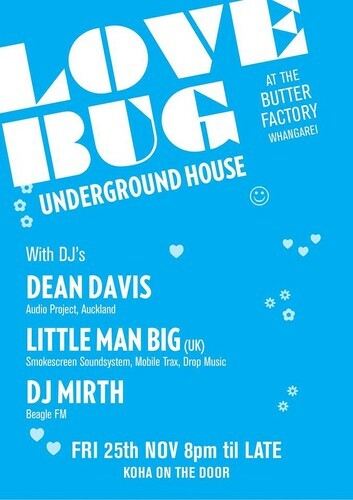 Love Bug returns to Whangarei and the beautiful setting of the Butter Factory. We're hoping for some nice warm weather to compliment the lovely outdoor courtyard. This time around we are proud to welcome Auckland's Dean Davis for the first time. Dean is the head honcho of Audio Project, a bi-monthly House, Electronica and Techno night held at Auckland's infamous Ink bar. He regularly plays many of the city's House and Techno club nights and has just returned from the United States where he was a resident dj at the 7 Deadly Gins Camp at Burning Man Festival 2016. He has played support for Internationals such as David Mayer, Madmotormiguel, Florian Kruse, Tama Sumo, Emerson Todd, Alex Kid, Detroit Swindle, Andy Riley (Inland Knights), Sonny Fodera and Fred Everything and recently played across the ditch at Melbourne's Pawn n Co. Warming things up in style will be Whangarei's own DJ Mirth - a talented young lady who we have noticed playing a blinder for Beagle FM. Expect a classy and often diverse selection of music from her. Linking up these two talents is Love Bug resident Little Man Big, formerly one-half of The Littlemen and a top producer in his own right with releases on labels such as Guesthouse, Aroma, Myna and Mobile Trax. He has also spent many years as part of the UK's legendary Smokescreen Sound System. Expect his usual brand of jacking dancefloor beats to keep your limbs twitching through the night.